American Eagle Outfitters USA online shopping is now available for international shoppers, especially when you have USGoBuy mail forwarding services with you. USGoBuy package forwarding service offers 60% off international shipping and free repacking, consolidation services. 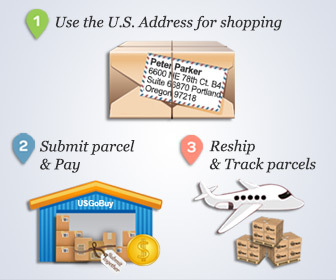 But how to use USGoBuy forwarding services for your shopping at American Eagle? First, of course you should become one of our members by registering at USGoBuy. Once you finished the registration, you will have a US address for your American Eagle shopping use. Place your order online at American Eagle and leave your USGoBuy address to receive packages within USA. Remeber, you get free shipping within USA for most of the purchases at American Eagle. USGoBuy can repack or consolidate your packages for free according to your requests! It is certain this free services will help you save more! The last step you do is choose your courier and pay for international shipping fee. Yes, AEO online shopping for international customers is that easy! Learn more about American Eagle & Why shop AEO as international customers? American Eagle Outfitters is a clothing retailer that prides itself on the quality of clothing it produces. Not only do they offer quality clothing at an affordable price, but they also have an outstanding group of service people available for all your concerns relating to shopping. American Eagle has online stores that are fabulous to shop at. Discontinued items can be found for next to nothing at their online stores. The prices are constantly changing, offering consumers opportunities to buy the latest trends at sale prices. Why International Customers Shop at AEO? Though international shipping to many countries is also offered by American Eagle online store, the shipping rate and relevant taxes are just too high to afford. That is why it is better to use USGoBuy shipping & mail forwarding service to save for your online shopping at USA American Eagle Outfitters. As a preppy, casual clothing store, American Eagle is best store to go for jeans, shirts, dresses and even a small selection of accessories and shoes. While their in-store sales are great, their online sales are even better. Do not miss out on an opportunity to get quality products at an affordable price, especially when cheap international shipping is available from USGoBuy!